things that have happened - . :Suzy Herbert:. 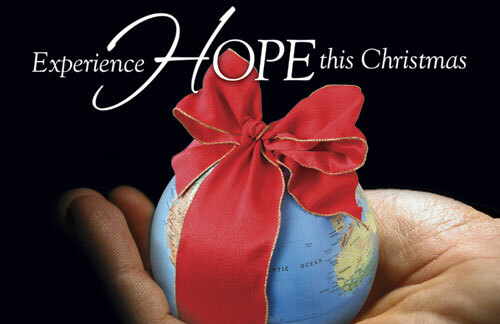 Suzy is singing in Suburban Christian Church's Christmas Musical this year: Hope of the Broken World. AND even better: she gets to sing a duet with her dad for the finale. It's going to be an unforgettable, heart-warming experience that will help to remind us why we celebrate the season of Christmas & that joy can still be found amidst the hustle and bustle of it all. or Sunday, December 9th at 9:30 or 11! A life of drama--A pretty girl is in love with the handsome man of her choice, but her ill, distempered father insists she marry someone else. It's a powerful problem. See who wins the war when you attend this pleasant play, THE HYPOCHONDRIAC, based on THE IMAGINARY INVALID by Moliere. tenderness and charming song tossed in. You'll want to enjoy an evening of comedy by Moliere. starting at 6:10 PM on performance nights. See you there. Her Majesty's Ship Pinafore is setting sail for the splash hit event of the summer! HMS Pinafore is among the most popular Gilbert and Sullivan operas, perhaps because of its infectious tunes and generally well-constructed libretto. Drawing on several of his earlier "bab ballad" poems, Gilbert imbued HMS Pinafore with mirth and silliness to spare. The opera's gentle satire reprises and builds upon one of The Sorcerer's themes: Love between members of different social classes. The gentlemanly captain of the Pinafore, who claims he would never swear at his crew (What, never? ), does not know that his daughter has fallen in love with a common sailor serving on his ship. Meanwhile, the captain has arranged for her to marry the First Lord of the Admiralty, Sir Joseph Porter. Sir Joseph himself has risen from humble beginnings to gain his office by political acumen, despite having never gone to sea! And the captain himself fancies a poor bumboat woman. Fear not: it all works out in the end. Hip, hip, hoorah! 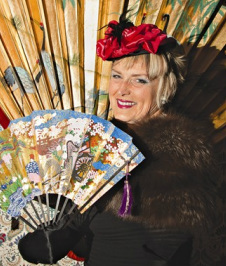 Suzy is proud to be returning as part of the annual spring cabaret show at Moonfall Theatre! This year's inspiration is the circus, so it's sure to be an entertaining evening -- it's billed as a comedy with original humor and music. Come one, come all to celebrate Moonfall's 22nd season! More details can be found over here. Suzy is excited to be working at a new studio in Salem: RISING STAR STUDIOS. She is personally going to be teaching voice and theatre, both individual lessons and group classes! She is thrilled to be making a living doing what she enjoys most: directing & acting & teaching & singing. Suzy also loves to inspire people of all ages to follow their dreams, and that's why RISING STAR STUDIOS is the perfect fit for her! To schedule private lessons or learn more about the studio call 503-999-9443! Check out this facebook page to stay updated on opportunities from this up-and-coming studio! "Disciplined living gets you admired, passionate living is contagious." What happens when Prince Charmless is the Kingdom's only hope against the evil Wicked Faerie? Will he actually save his True Love? Who IS the Maiden Taiwan? What does Snow White *really* think of the Seven Dwarfs? And will the Beast EVER get a chance to write his memoirs?? It's once upon a time like you've never seen it before! Don't miss this fantastical, fast-paced comedy suitable for the whole family! 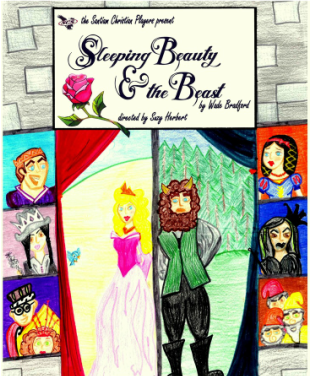 Come see Wade Bradford's best-selling SLEEPING BEAUTY AND THE BEAST directed by Suzy Herbert. 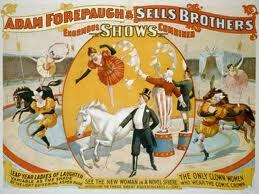 Performances begin at 7pm ~ March 15,16,17 at the Majestic Theatre in Corvallis. Buy your tickets at the Santiam Christian High School business office, or at the box office the night of shows! Students/Seniors $6, Adults $8 -- Thursday night special: 2 for 1 price! *Suzy directed SLEEPING BEAUTY AND THE BEAST to rave reviews and sold-out audiences! DVDs are available for $10 if you missed the magic, or want to relive the laughs again and again! Take a trip down ye olde yellow brick road this December, and experience an unforgettable evening at the theatre that will keep the entire family captivated! Suzy is going to be the rehearsal accompanist for South Albany's musical: The Wizard of Oz. We're off to see THE WIZARD OF OZ! At 51, Julia Goldman thought she'd done it all. Widowed for two years, financially well-off, with two grown children busy in their own successful lives, Julia found life routine and uneventful, and expected to ease into her sunset years. Suddenly, "Life with a Capital L" hands her what is to become the biggest decision of her life; the sort of occurrence to which many a younger woman would hardly be equal. An accidental encounter in the cocktail lounge of a posh hotel with a man who sweeps her off her feet and then disappears leaves her with much more than just a fond memory. Directed by Rebecca Douglas, this play is sure to provide the audience with an entertaining evening! 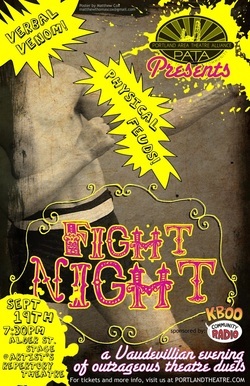 Kick off the new theatre season by sampling the awesome variety of talent from Portland’s theatre scene: Fight Night is a thrilling and hilarious vaudevillian showcase of fights from some of our most entertaining theatre genres, presented by some of Portland’s brightest and best-loved theatre companies and actors. Join us on the evening of the 19th to see it all: Verbal jousts! Stage combat! Sing-offs! Aristocrats, low-lifes, aliens and puppets! You’ll laugh, you’ll gasp… you may even get to throw a pie! Join us in celebrating the primary force behind all drama: The fight! All proceeds benefit the Portland Area Theatre Alliance. (Please note: this evening is recommended for audiences aged 14 and up). What: An evening of performing arts theater featuring Broadway music, comedy sketches, original humor and improv. When: Friday and Saturday, May 20-21, and Friday and Saturday, May 27-28. Each performance begins with appetizers in the garden at 6:30 p.m. Seating is at 7:20 p.m., with the performance starting at 7:30 p.m. Desserts will be offered in the dining room during intermission. Where: Moonfall Theatre, 11140 Orrs Corner Road, Rickreall. Of note: All shows benefit a local nonprofit organization. Friday's performance benefits Polk County ARC. Saturday, the proceeds go to Beta Sigma Phi. On Friday, May 27, the show will benefit the Fall City Art Center and proceeds from the last performance Saturday, May 28, will go to Polk County Relay for Life. MAY I HAVE THE DEFINITION, PLEASE? This hilarious musical tale of overachievers' angst chronicles the experience of adolescent outsiders vying for the spelling championship of a lifetime. 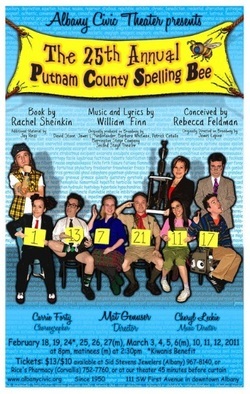 It's about the unlikeliest of heroes: a quirky yet charming cast of outsiders for whom a spelling bee is one place where they can stand out and fit in at the same time. Spelling Bee opened on Broadway in 2005 to rave reviews and went on to win Tony awards for Best Book of a Musical and Best Featured Actor.